My love for Chicken Pot Pie has a long history. 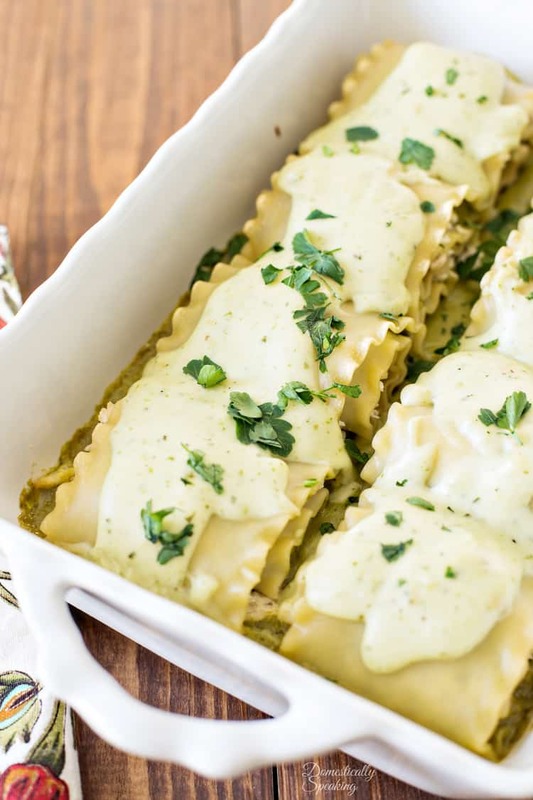 Ever since I was a little girl I couldn’t resist that flakey crust wrapped around chicken and my favorite veggies in a delicious creamy sauce. 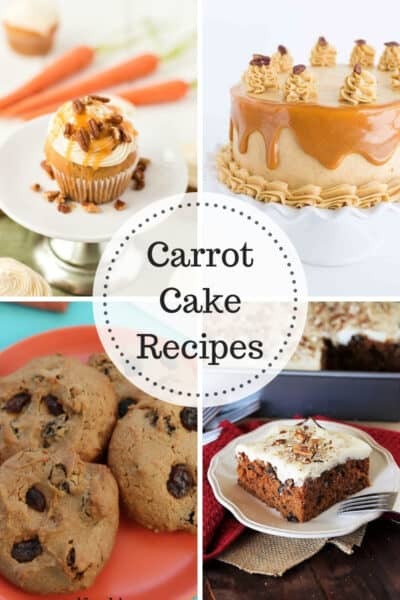 Over the years I’ve worked on my own recipe and today I’m sharing that with you. I have a confession, I do not like peas. Traditionally you find peas in chicken pot pies, but my version has my favorite comfort veggies, carrots and potatoes. 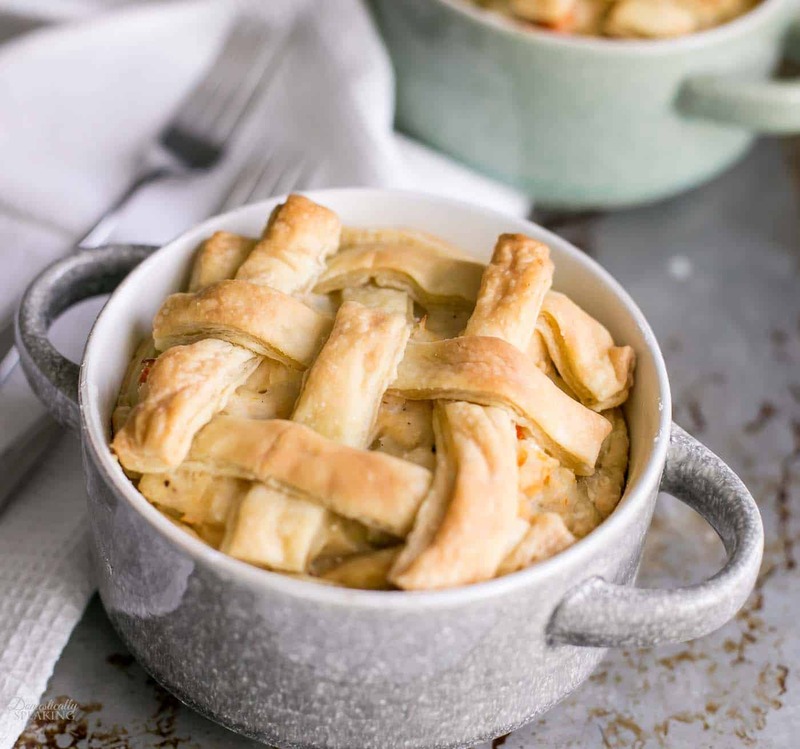 I love using puff pastry for my chicken pot pie for many reasons. Puff Pastry is so easy to use. Keeping a box in your freezer is a great idea. I just pull it from freezer to thaw about 30 minutes before making my chicken pot pies. I love the light, fluffy layers that you get with puff pastry. You could use regular pie crust though too. 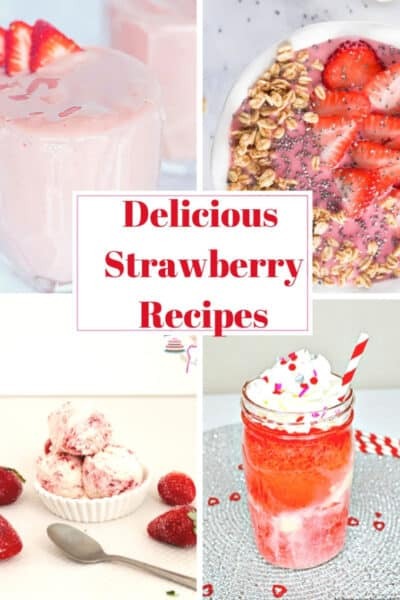 For this recipe, you will probably need to cook it for a few more minutes. 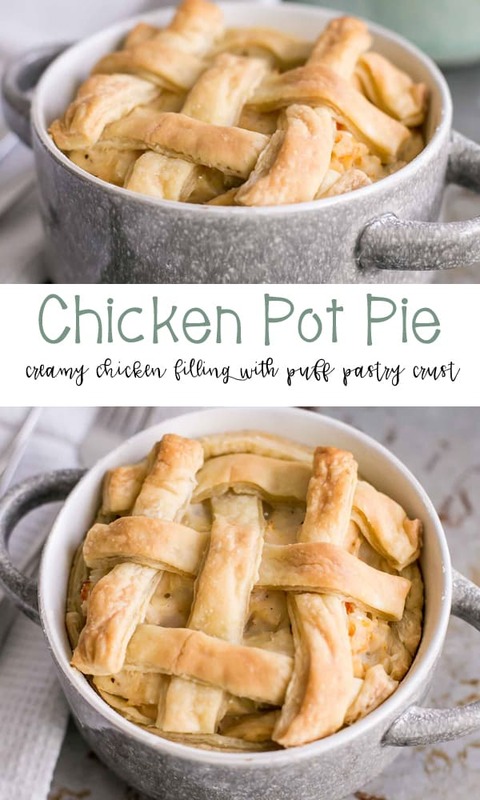 I love making chicken pot pie with my leftover chicken! Each week I typically cook up a bunch of chicken breast at the beginning of the week. 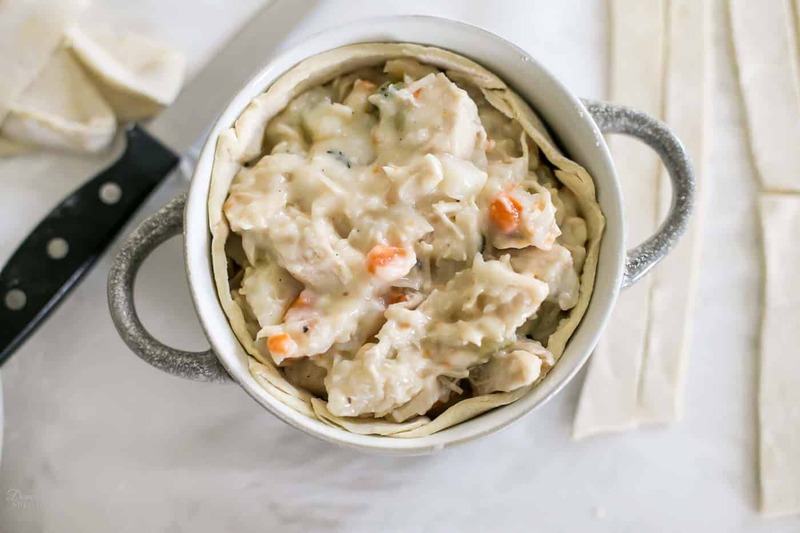 Having this prepped chicken makes meals so much easier during the busy week, and it is perfect for making chicken pot pie. 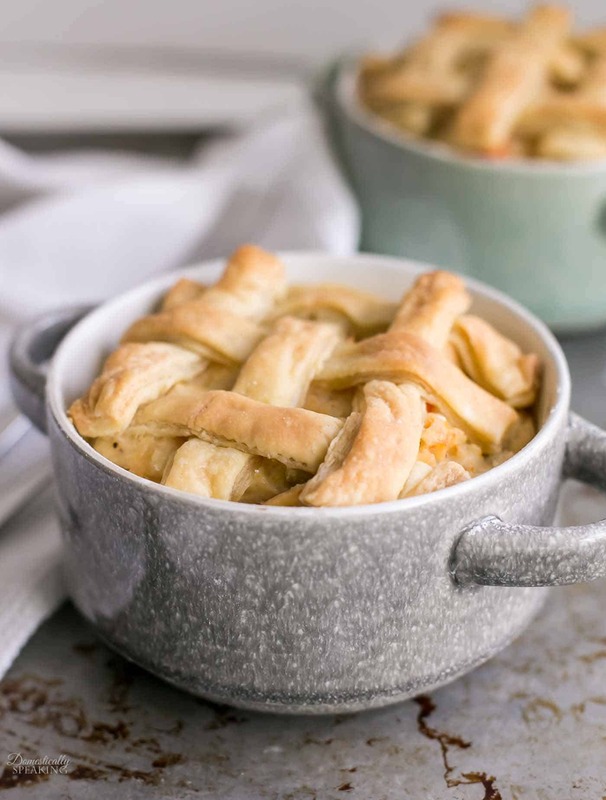 Now let’s get into how to make this delicious chicken pot pie with puff pastry crust. Prepping the veggies comes first. 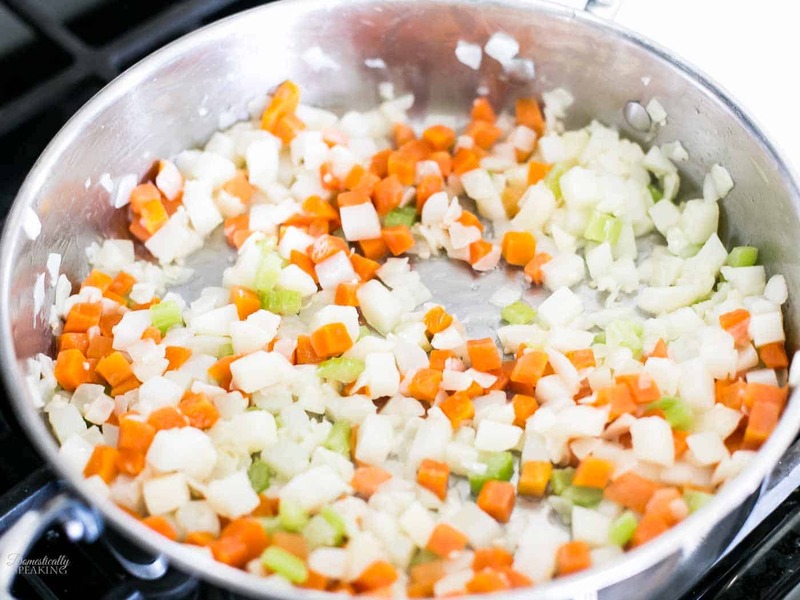 Sauting the onions, garlic, celery, potatoes and carrots in some butter is the first step. 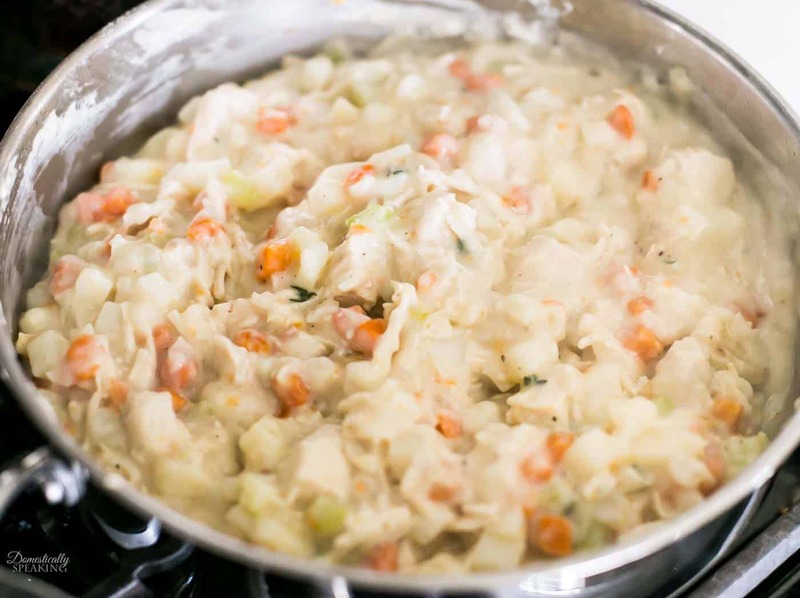 The final step for this creamy chicken pot pie filling is adding the cooked chicken. 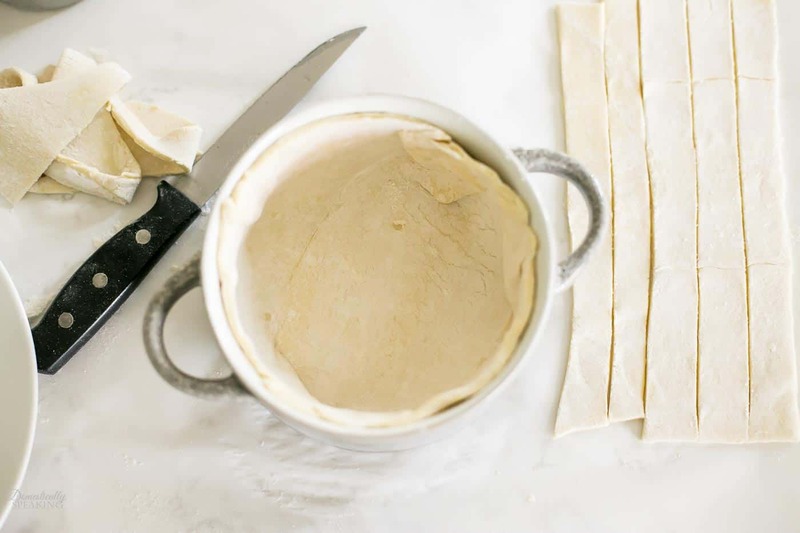 You’ll want your puff pastry to be able to thaw for about 30 minutes if it’s been in the freezer (it will take a little longer if your house is chilly like mine was). You’ll want to sprinkle some flour onto the surface you’ll be working on. Unwrap 1 piece of the puff pastry and place onto the floured surface. Flour your rolling pin lightly, and gently roll out the puff pastry. 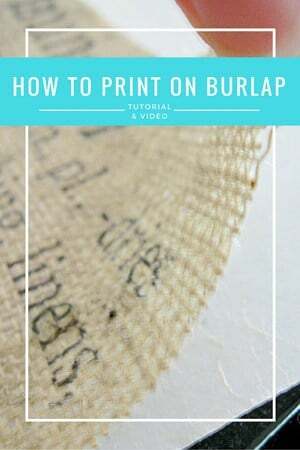 You are looking to enlarge the sheet of puff pastry just a little, but mainly working to smooth and seal the creases that the puff pastry has from being folded in the box. I used my smaller plate (dessert/salad size) as a template for my puff pastry. It was the perfect size for cutting the right shape to place into my large soup bowls. Gently push the puff pastry into the base of the bowl. Now I used 2 large soup bowls for this recipe. These bowls hold 2 servings each. So if you use smaller bowls or ramekins you’ll need to find the right size plate or mug to use for your template. 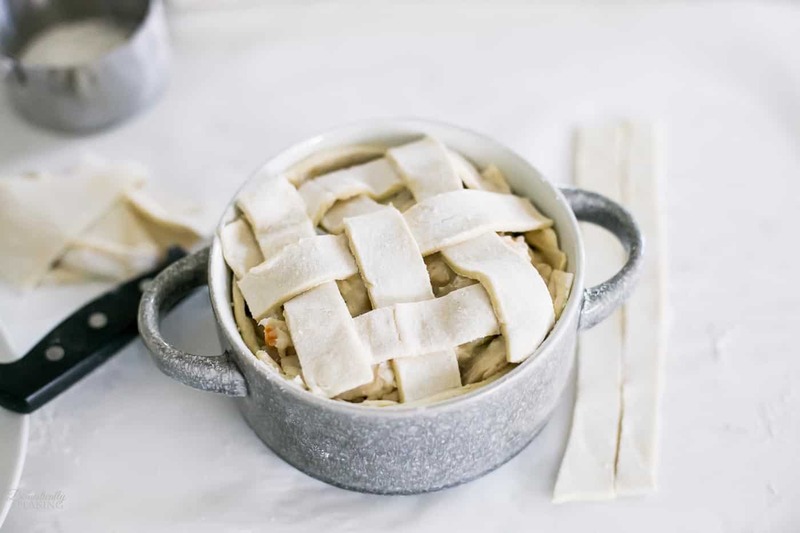 I went with a pretty, rustic top for my chicken pot pie by creating an easy lattice top. My box came with two puff pastry sheets. Each of my large soup bowls took 1 sheet of puff pastry. That one sheet of puff pastry created the bottom crust and the lattice topping. To create the lattice topping I just cut the remaining pieces of the puff pastry into long strips about 1 inch thick. I just did the over-under pattern to create the lattice topping, and I used 3 pieces each direction. 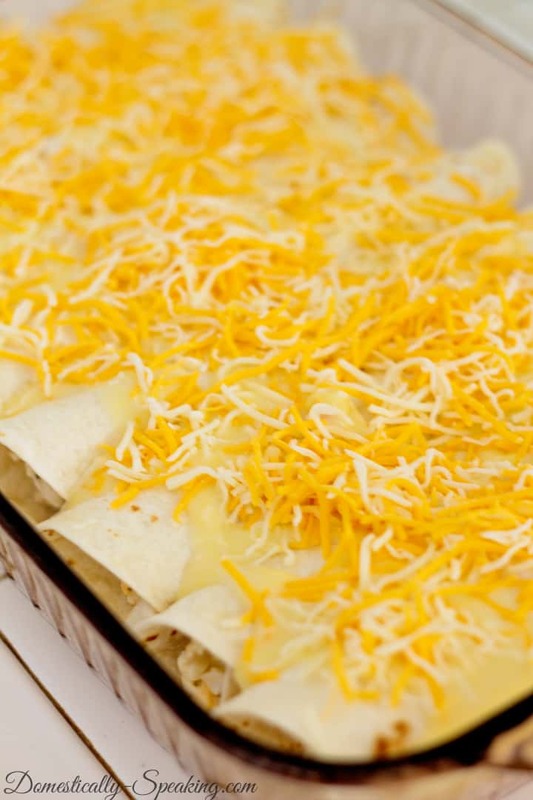 Super simple to do, and it makes for a beautiful presentation later. 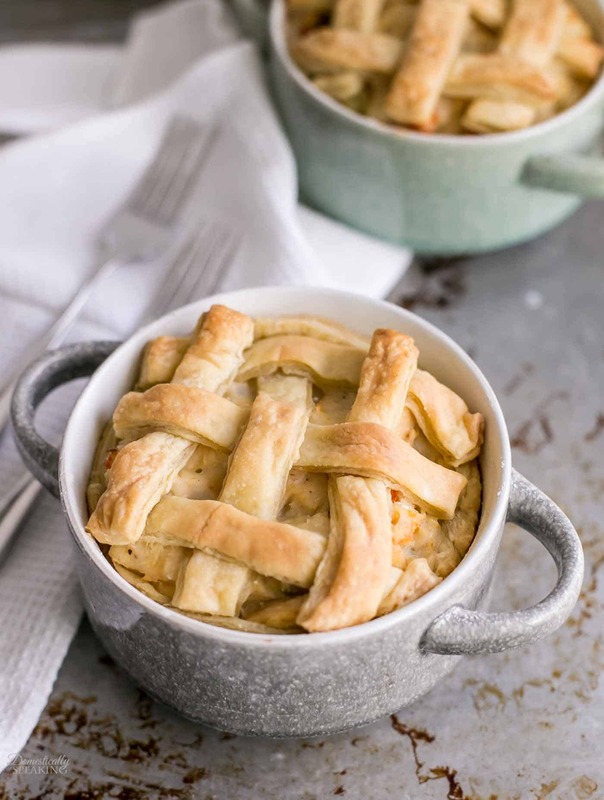 Then it’s time to bake up this beautiful Chicken Pot Pie with Puff Pastry Crust. 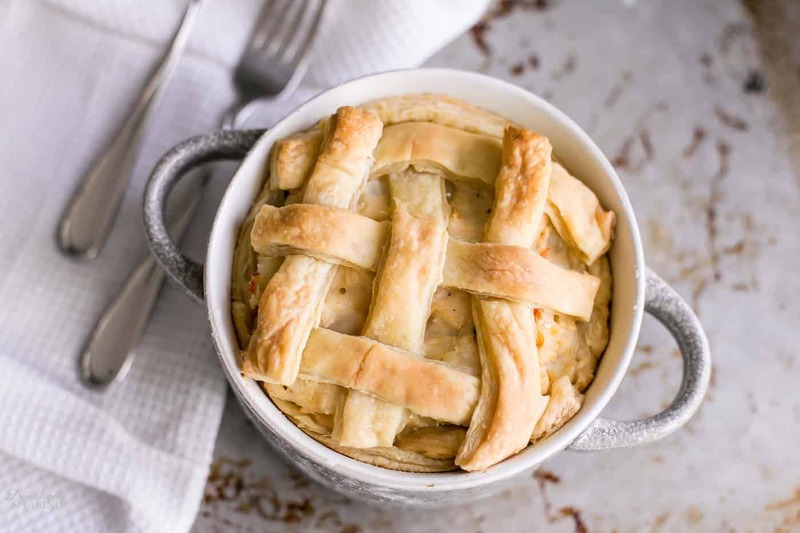 Rustic Chicken Pot with a flakey puff pastry crust that is filled with a creamy chicken filling with potatoes, carrots, celery and onions. Preheat your oven to 400 degrees and remove the puff pastry from freezer or fridge to thaw. In a large frying pan, melt the butter over medium heat. Add the chopped onion and let it saute and soften for a couple of minutes. Add the celery and the minced garlic. Stir and let saute for a couple of minutes. 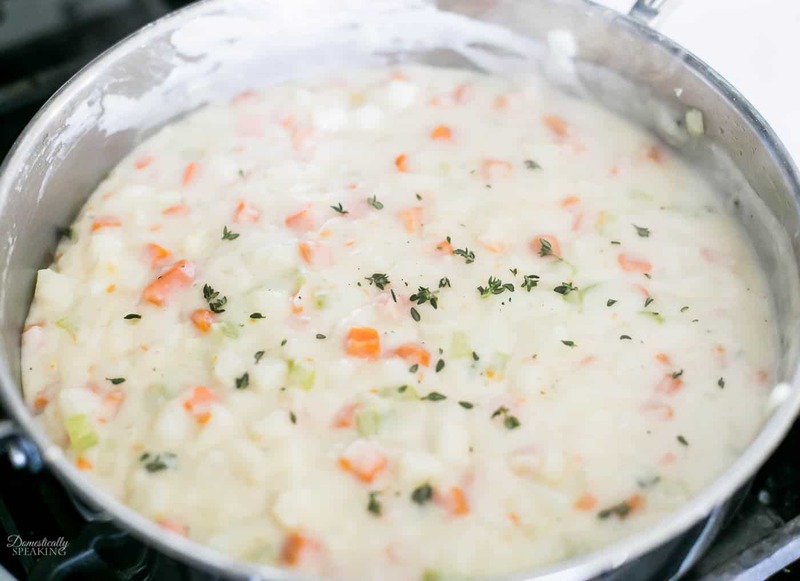 Add the potatoes and carrots, and stir. Let it saute for a couple of minutes. Sprinkle the tops of the veggies with the flour. Continuing stirring the combine the flour with the veggies for 1 minute. Add the chicken broth and stir until combined. Let the chicken broth start to heat for a couple of minutes. Add the milk. Stir to combined. The mixture with is thickening by now. Let it simmer for a couple minutes, stirring occasionally. Add the thyme, salt, and pepper and stir it well to combine. Add the cooked chicken and stir well. Turn the heat to low and let it simmer about 5 minutes as you prep your crust. Open 1 sheet of puff pastry and fold it open onto a lightly floured surface. With a floured rolling pin gently roll over the sheet of the puff pastry. You are looking to enlarge the puff pastry just a little, but mainly trying to smooth the seams from the puff pastry being folded. Use a template to cut out the chicken pot pie base. I was using 2 large soup bowls for mine, so I used a salad/dessert plate as my template. Press the base of the crust into the bottom and sides of the soup bowl. Repeat these steps for the second soup bowl. 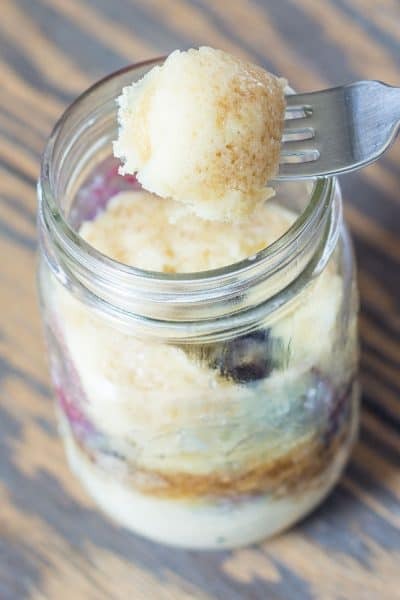 If you are using smaller bowls/ramekins then repeat until all your containers are their base crust. Scoop the chicken pot pie filling into the bowls. Since 1 was making 2 large soup bowls, I put half the filling into each bowl. 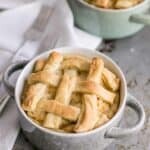 Create the lattice pie topping by cutting 1 inch strips of the leftover puff pastry. Place on top of the chicken pot pie filling using an over-under pattern to create the lattice top. Repeat on the remainder of the pie tops. Place into the 400 degree preheated oven on a cookie sheet and bake for 45-50 minutes until the top is golden brown. Can Chicken Pot Pie Be Reheated? YES!!!! 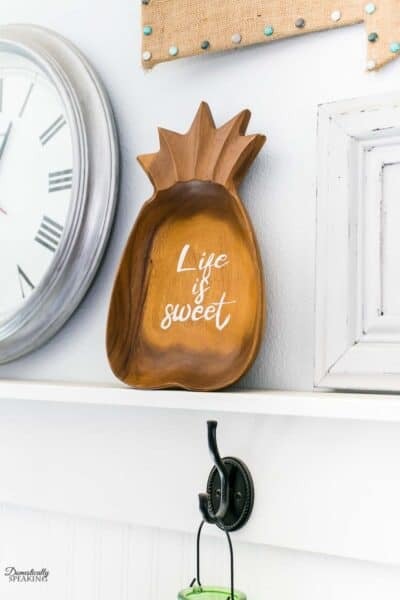 You can always go with the microwave option. I will start with reheating for 1 minute at cook power 50% and check if the inside is hot enough. If not microwave in 30 second increments at 50% power until desired warmth. My preferred method on how to reheat chicken pot pie is in the oven. Cover the leftover chicken pot pie with aluminum foil. I hope you enjoy checking out this chicken pot pie recipe soon. 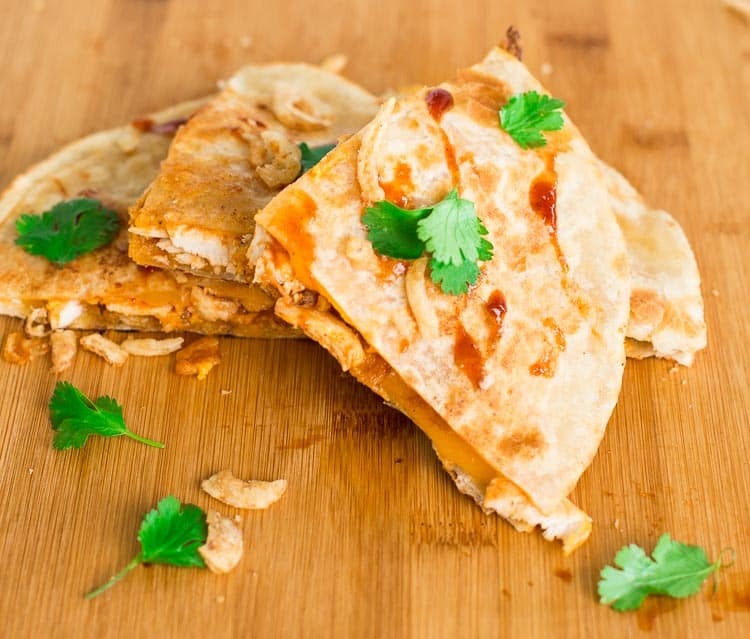 If you love other recipes using leftover chicken you’ll want to check these out.